Successfully Added M96X Plus Android TV Box - Amlogic S912 SoC, 2GB RAM, Dual Band Wi-Fi, Android 7, Kodi, 4K to your Shopping Cart. The M96X Plus Android TV box is powered by the Amlogic S905X SoC and has a mighty 2GB of RAM. This is enough processing power for games, movies and surfing the web without any lag. The Mali-T820MP3 GPU handles all your graphic needs and with HDMI 2.0 you will be able to enjoy 4Kx2K resolutions. So the latest sports, films and TV shows can be displayed in all their detail. Having an Android 7.1.2 operating system means the best tools and apps that your familiar with on your smartphone can now be enjoyed on your TV. This mini TV box also comes with Kodi preinstalled so you can find a plethora of channels and stream media to your heart's content. Dual band Wi-Fi support as well as Ethernet LAN ports bring lightning quick internet access so playing online games or streaming content is smooth and lag free. This TV box is a great way to upgrade your screen or TV to a smart home entertainment system with quality visuals and stunning audio, thanks to the SPDIF port. 16GB of onboard storage is sufficient for most but the addition of 4 USB ports as well as micro SD slot let you add even more storage options. The TV box comes with its own remote control but by accessorizing with a BT keyboard and mouse you can turn this TV box into a workstation and its portable size make it an appealing option for working away from home or the office. 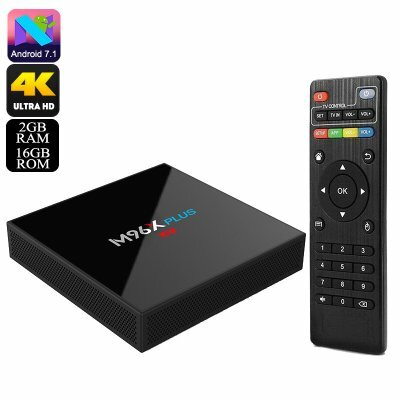 The M96X Plus Android TV Box comes with 12 months warranty, brought to you by the leader in electronic devices as well as wholesale TV boxes and media gadgets..